Use Visual Studio to query Azure SQL Data Warehouse in just a few minutes. 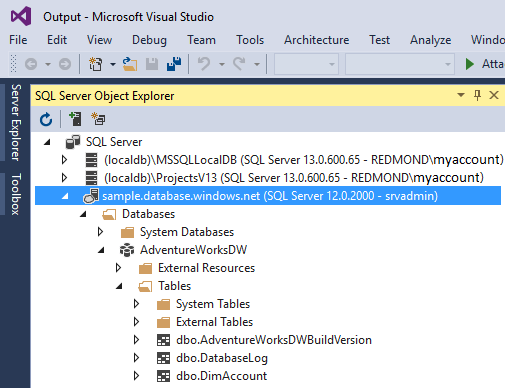 This method uses the SQL Server Data Tools (SSDT) extension in Visual Studio. An existing SQL data warehouse. To create one, see Create a SQL Data Warehouse. SSDT for Visual Studio. If you have Visual Studio, you probably already have this. For installation instructions and options, see Installing Visual Studio and SSDT. The fully qualified SQL server name. To find this, see Connect to SQL Data Warehouse. Open Visual Studio 2013 or 2015. Open SQL Server Object Explorer. 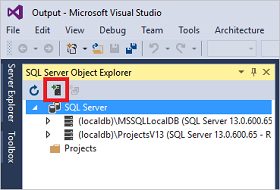 To do this, select View > SQL Server Object Explorer. Click the Add SQL Server icon. Fill in the fields in the Connect to Server window. Server name. Enter the server name previously identified. Authentication. Select SQL Server Authentication or Active Directory Integrated Authentication. User Name and Password. 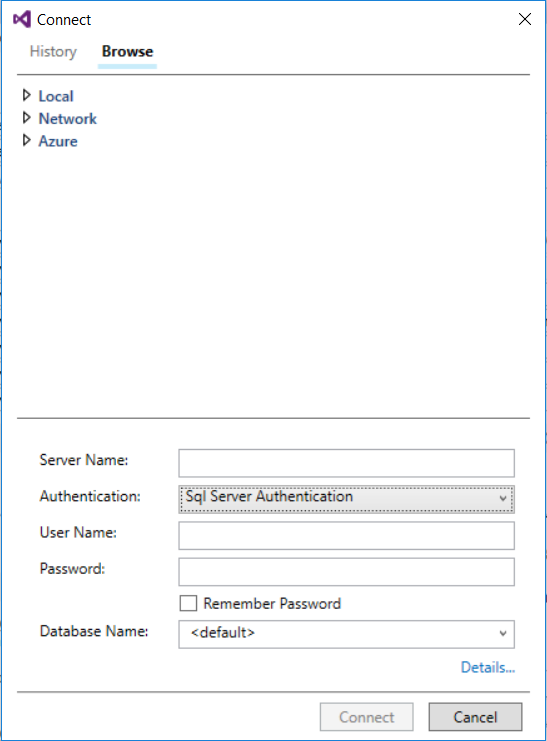 Enter user name and password if SQL Server Authentication was selected above. To explore, expand your Azure SQL server. You can view the databases associated with the server. Expand AdventureWorksDW to see the tables in your sample database. Now that a connection has been established to your database, let's write a query. 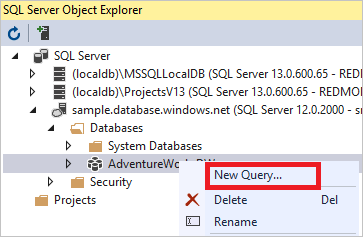 Right-click your database in SQL Server Object Explorer. Select New Query. A new query window opens. Run the query. To do this, click the green arrow or use the following shortcut: CTRL+SHIFT+E. Look at the query results. In this example, the FactInternetSales table has 60398 rows. Now that you can connect and query, try visualizing the data with PowerBI. To configure your environment for Azure Active Directory authentication, see Authenticate to SQL Data Warehouse.